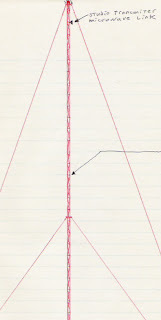 A tower I drew while I was in college, probably while I should have been taking notes in class. Media full of news about Imus firing from CBS. Also people full of questions, "why is radio talk so mean spirited?" "Why don't liberal talkers do as well in the ratings on commercial radio?" Well, maybe it's because a big share of the radio audience is driving. Yes, driving and fighting traffic. People often say that they become a different person when they get behind the wheel of their cars. More angry, mean spirited, hurried. "Move it buster, don't take all day." That may influence which stations get tuned in. I know some drivers who want soothing programs, but maybe they are more apt to go for music, rather than talk radio. Classic KING FM (in Seattle) for instance. As for me, I listen to radio a lot, but I don't drive. My dial is often set to gentle and educational talk. Talk like one finds on NPR and Seattle's KUOW. Also on some other stations like Canada's kind and gentle CBC Radio One with CBU out of Vancouver, BC. Even KGO out of San Francisco, CA. has some good talkers, but being a commercial station they do have some yellers as well.